Once you’re logged into your account simply click the giant “+” symbol on the dashboard, select the files you’d like to upload, and use drag-and-drop to place them into the files box (or use the file selection tool). Next, fill in the text boxes with your recipient’s email address, a conversation title (similar to an email subject line), and whatever comments you think the recipient will need to understand the context of the conversation. When you have composed your message, hit the “Share” button. 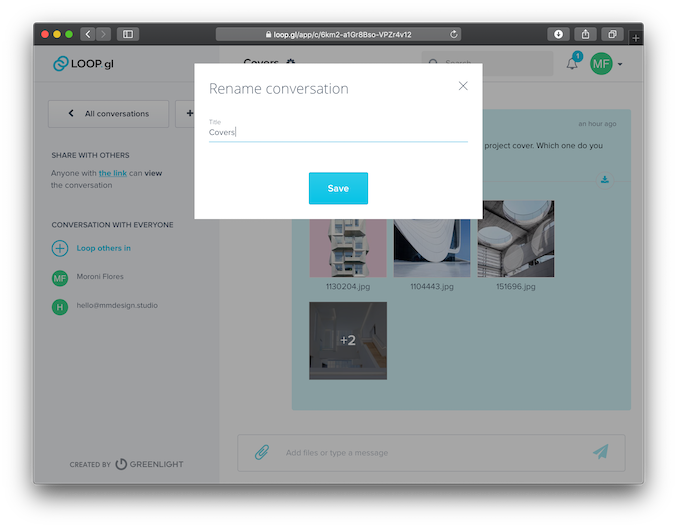 Note: Once you have your account created, you’ll see an extra option during the Loop creation process - the ability to customize the conversation cover image. If you do not choose your cover image the conversation will get one from the general Loop covers. To start your own Loop conversation, go to our homepage. 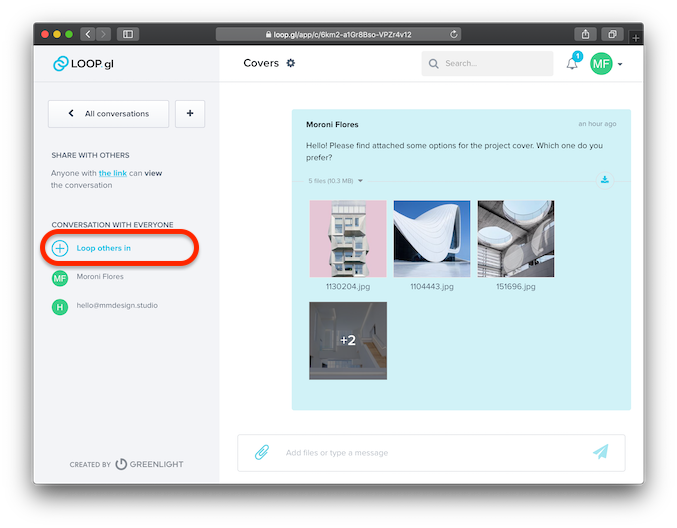 Select the files you’d like to upload and use drag-and-drop to place them into the files box (or use the file selection tool). Next, fill in the text boxes with your recipient’s email address, a conversation title (similar to an email subject line), and whatever comments you think the recipient will need to understand the context of the conversation. When you have composed your message, hit the “Share” button. When starting a Loop conversation, you have to start by sending it to someone other than yourself (the creator). Once a Loop conversation is created, you can add up to 14 additional users to the conversation, meaning you can have a Loop conversation consisting of 16 people (the author, the original recipient, and 14 others). To add more people to your Loop conversation, click the “Loop others in” option on the panel on the left-hand side of the screen. Add the email address of the person you want to add, then click the “ADD” button. Recipients will be notified through email and, if they’ve already downloaded it, the Loop mobile app. If you’d like to share a public link, you can find it in the “SHARE WITH OTHERS” section on the left side of the Loop conversation screen. Keep in mind that this is a public link, so anyone who clicks the link can access your file conversation. If you don’t want a public link floating around, we suggest you add people through their email address by using the “Loop others in” option as described above. Communication is important in any project, so Loop has made it easy for you to stay up to date. Click (or tap, if you’re on mobile) the text field at the bottom of your screen Type your message in the text box at the bottom of your screen Click (or tap) the send icon ( ) to send your message. To read messages in Loop, click the conversation you’d like to view. Messages are shown in chronological order to make the conversation easy to follow. Loop can notify you to ensure that you don’t miss a thing in a few ways. 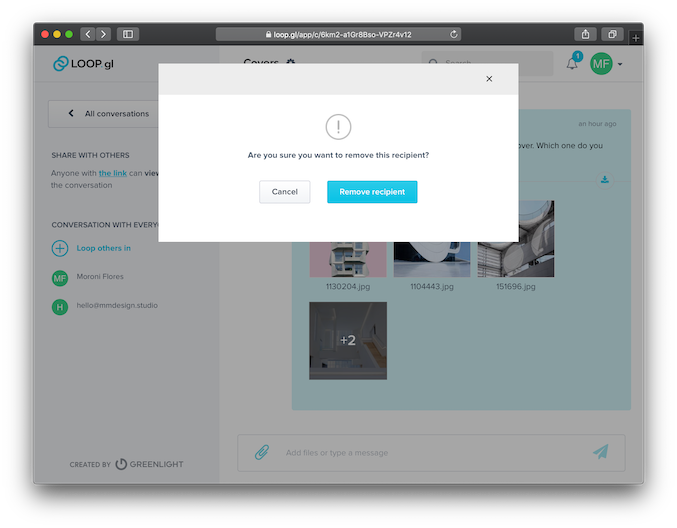 In-app notifications: Once you’re signed in, Loop can send a notification through either your desktop browser, your mobile device, or, if you’d like, a combination of both. Email notifications: Loop can also send you an email notification. You can customize these notifications to be sent in 10-minute batches or a daily summary. Some example notifications might include new comments in a conversation, file upload confirmations, someone sharing files with you, or someone adding you to a Loop conversation. Loop users have access to some stock images that they can use to spice up their Loop conversation covers. If you would like to add your own custom conversation images, you’re more than welcome to do that as well. 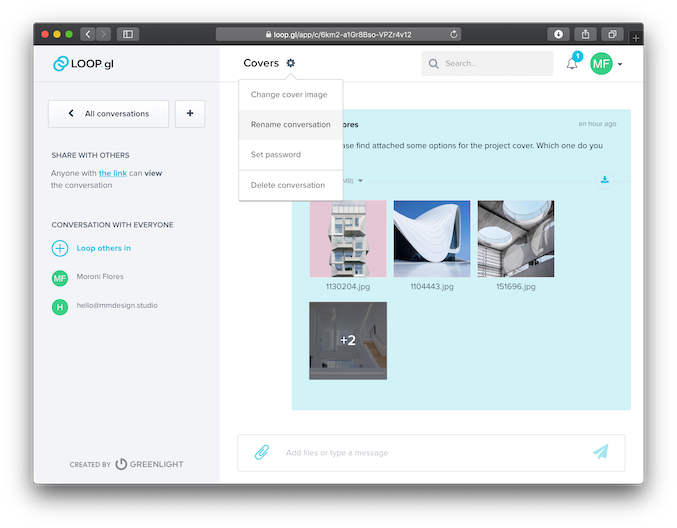 You can use custom conversation images to personalize a conversation with your client’s branding or just make it visually easier to locate different Loop conversations. 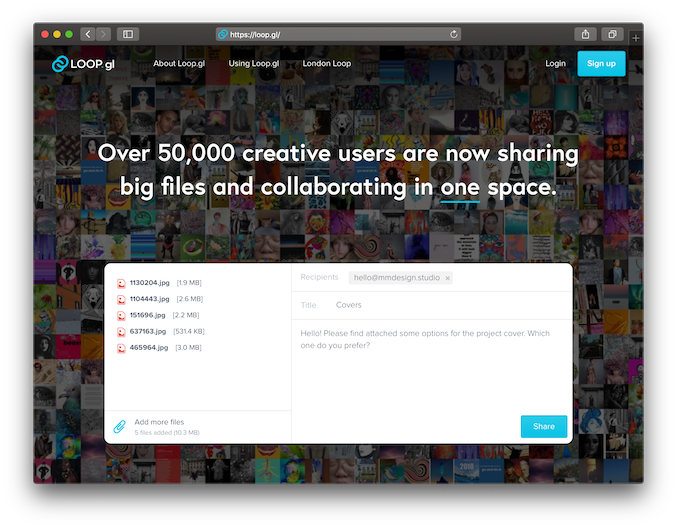 Transferring large files is a breeze with Loop. Users have a massive size file limit of 15GB. 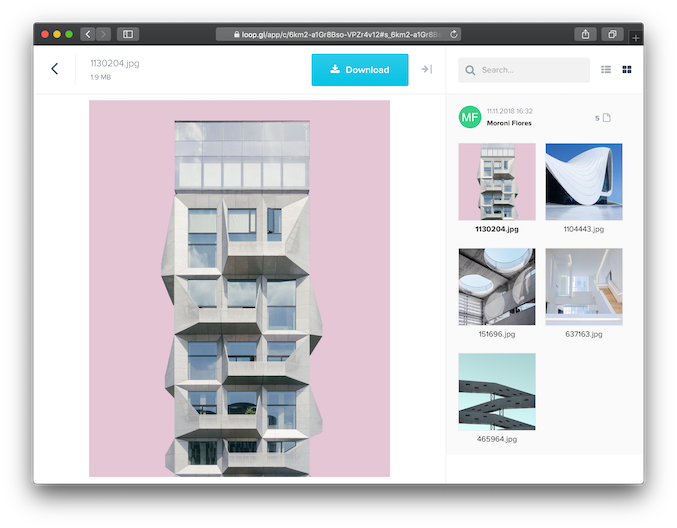 With Loop, you can preview files like pictures, PDFs, PPTs and more without needing to download them. If you want to download multiple files as a zip, choose the “download as .zip” option in the app. Only the author of the conversation can rename it. To do so, click the settings icon next to the current Loop conversation name and select the “Rename conversation” option. If you need to remove someone from a conversation, simply click the trash icon beside their name in the left panel. To delete a conversation, click the settings icon next to the current Loop conversation name and select the “Delete conversation” option. Note: Only the author of the conversation can delete it. When you delete a Loop conversation, it’s gone for good. There isn’t any way to recover the files or conversation.